There's few better blessings than a long-term friendship. From at least 1916, Lillian Christensen and Marie Morse were friends, with the Morse family living on the next block over on Beach street. The Morses eventually moved from Huron, but the families still got together. When Lillian passed away, Marie's name and address were in her address book, though they probably did not get together in person frequently if at all. Below, Lillian and Marie through the years - top, about 1916; middle, 1927. Katrina, I'll find you if it takes me the rest of my life. And it might. Jens and Katrina Jensen and their children lived in Council Bluffs, Iowa after immigrating from Denmark. After a few years, they moved across the river to Omaha, where Jens owned a bakery and Katrina helped in the operation. The next mention of them is in a couple of letters written by Katrina's brother Pete, who had moved to California, where she and Jens also lived at that time (1940s). I don't know exactly when they moved to Los Angeles. Katrina was a witness at the wedding of her sister, Caroline, in 1924 in Council Bluffs, so I presume they made the move soon after that. My search for these people in California has hit more than one roadblock. First, my best source of directories was Ancestry.com, and it was disheartening to realize that their collection from the late 1920s until about 1935 consisted of partial directories. And, you guessed it, the parts I needed were missing. I was able to overcome that by (eventually) discovering that the LA Public Library has online copies of the years that I needed. Between the two sources, I figured I'd have it easy from that point on. There did not appear to be a Jens Jensen who was a baker, or who had a wife listed by the appropriate name. There were no entries for a Katrina Jensen at all. Thank goodness I discovered a bare-bones death notice for Katrina, or I would have been totally up the creek, in more ways than one. 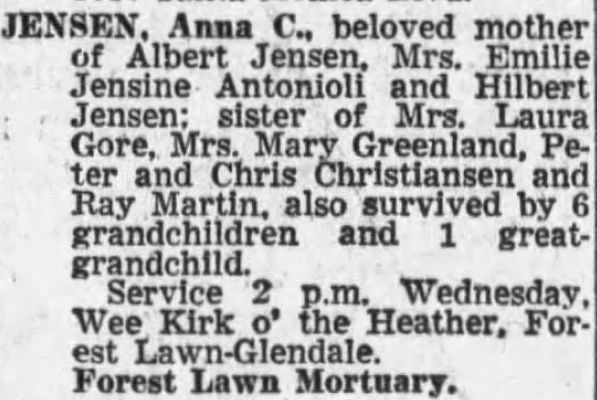 Born Ane Katrine in Denmark, her death notice called her Anna C. If it hadn't listed her children by name, I would never have known it was her. I went back to the directories and began not only looking for Anna, but Catherine, even Kathryn. Unfortunately, all three are common names, and I had no way to distinguish which if any of these women were my Katrina. In rereading her death notice, it finally hit me like a rock upside the head that her children would have been adults during those years. So, back to the directories. I was grateful that her oldest son had an uncommon name like Hilbert. But he apparently did not go to Los Angeles with the rest of them, as he was not listed in any of the directories. Her other son was Albert - and there were a number of Alberts listed. Then - there was her daugher, Emilie. No matter how it was spelled, it did not appear to be a common name at that time and place, and I was able to find one "Emilie" listed. I noted the address, and went back to check Jens, Anna/Catherine/Kathryn and Albert. I was able to find a Catherine and an Albert at the same address as Emilie. Voila! Catherine was a seamstress, which was a handy thing to know - because they moved every year or two. Of course. But at least they did not change occupations like they did addresses. Albert got married and settled down in a house of his own, but I was able to continue to track Catherine and Emilie in this manner, until Emilie did the unthinkable - she got married. None of the Catherines I found in the directories after 1936 was a seamstress, and none of them had the same address as Emilie or Albert. The trail had gone cold. And Jens? I continued to find several Jens Jensens, who were bakers in Omaha long after Katrina had been documented in California. Perhaps he didn't follow them when they left. However, he is buried with Katrina in Los Angeles. Clearly there are a lot of questions left to be answered, but right now, I'm out of ideas. I'm focusing my research on her descendants and siblings in hopes that I might get a fresh lead on her. Who is on Card #143? Tonight seemed like a good night to fill in the South Dakota State Census information for my grandmother's family of origin. The state census was taken every five years, and FamilySearch.org has the actual cards filmed, so I bypassed Ancestry and went directly there. Because the cards are arranged alphabetically, I needed to look up each person in the household separately, which was no big deal. I happened to be working backward, from 1935 to 1905. The mystery is in the 1915 census. I found my great-grandfather, Peter Christensen, Card #141, first. Then his wife, Ella, Card #142. Then I found my grandmother, Lillian, age 3, Card #144, and finally, Raymond, age 1, Card #145. The next child to be born would be Clarence in 1917. So, who is enumerated on Card #143? Perhaps for some reason the card needed to be destroyed and does not exist. The most natural supposition is that Ella's mother, Alvilda Monsen, is on that card. Alvilda arrived at New York City, aboard the ship "Kristianiafjord", on 16 May 1915. She was bound for Huron, South Dakota to the home of her son-in-law, P. C. Christensen. I do not know the exact date the Christensens were enumerated, or if Alvilda made it there in time to be counted among the household. Family Search did not list an Alvila, Alfhilde, Monsen, Monson, nor Munson in the index. Ancestry did not, either. So, the question remains: Who is on Card #143? Where in the World are Jens and Katrina Jensen? The Christensen sisters, Laura and Katrina, are proving to be some of the biggest challenges I've had as a family historian. After weeks of trying to track Laura after her divorce, I've come to the conclusion it's much like trying to nail smoke to the wall. Sometimes she's Laurine. Sometimes she's Laura. Sometimes she's Lorraine. And she doesn't stay put, either. I thought I'd give myself a break and see what I could find out about her sister, Katrina Jensen. She seemed to live a nice, tidy life through the 1920 census, when she and her husband Jens owned a bakery in Omaha, Nebraska. The next thing you know is it's 1930 and she is a widow living in Los Angeles, doing alterations for a department store. 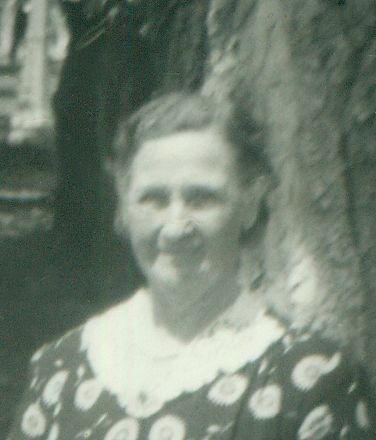 She did appear as a witness to her sister's marriage in 1924 in Council Bluffs, Iowa, so it was probably after that time that she went to California. Thank goodness for city directories... when they are intact and complete, that is. Unfortunately, Ancestry's Los Angeles directories for the period 1925-1934 are incomplete. Each of these directories is missing huge chunks, all of which include the "Jensen" listings. Starting in 1935, I was able to find some information. Katrina, unfortunately, used different names on various documents. She was born Ane Katrine, but was unknown as Katrina, Catherine, and Anna Catherine, Anna C., and all of these variations with the common surname of Jensen. Thank goodness she had a daughter named Emilie, so I was able to find Emilie's listing and then go back and see if there was anyone with any of the variations listed at the same address. But once Emilie married and had a residence with her husband, I was out of luck. And it certainly did not help that Katrina moved every couple of years. I checked every Los Angeles city directory available for each of her children, and then cross-checked by address for any Catherine or Anna Jensen that might have the same address. I was able to find her in the 1936 and 1937 directories, but not after that. I checked the 1940 census - every way I could think of - and could not find an entry for her. The next time there's any definitive evidence of her is in December of 1946, when her brother mentions her in a letter as living in the Silver Lake neighborhood of Los Angeles. The next (and last) time would be her death in August of 1968, in Los Angeles. She was buried next her husband Jens, who died in... June of 1950??? I went back and checked every one of those directories again for Jens, and with multiple Jens Jensens, I again cross-checked the addresses of his children to see if he might be living with either of them. No luck. Were they divorced? Maybe. But if so, it was certainly amicable, as they are buried together, in the same lot, at Forest Lawn cemetery in Glendale. 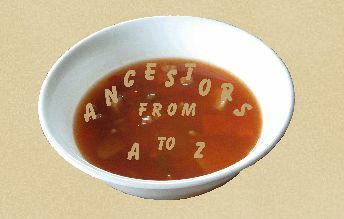 This family history stuff is going to send me to the poorhouse. Remember "Person-to-Person" phone calls? For you youngsters who never had to pay for long distance calling, this was an operator-assisted call placed from you directly to a specific person rather than a general phone number. If they weren't available, you did not have to pay for the call. If they were home and came to the phone, it was even more expensive than long distance. You may have seen the Geico commercial on TV employing that strategy. They just had a baby, but don't want to pay for a call, so he places a person-to-person call to Bob WeHadABabyItsABoy, and the guy on the other end of the line tells his wife "They had a baby, it's a boy." We used to do the same thing when my husband traveled - when he got to his destination, he'd place a person-to-person call to himself at our number, and then I'd know he made it okay. We didn't get to talk, but he got his message across. I decided to employ that same technique to answer a burning family history question without having to empty my wallet on yet another newspaper subscription. I already have two similar subscriptions, and through them I learned that my great-grandfather, P. C. Christensen, opened Bell Bakery in Huron, South Dakota sometime between October of 1908 and March of 1909. I was hoping to learn more about exactly when the bakery opened, and how he came to be associated with his partner, Clarence Bell, both of them moving to Huron to open that bakery. But neither newspaper website covered that crucial time in between those dates. Newspaper Site #3 does. Voila! I decided to try the Bob WeHadABabyItsABoy technique, and did a search for Bell Bakery between October 1, 1908 and March 31, 1909. I got numerous hits, with previews, for October of 1908. Great news! The bad news is that the previews aren't telling me a lot. Some look like advertisements, but others are so vague... it does, however, narrow down the dates considerably. However, my brilliant strategy is still going to end up costing me money. There is an advertisement for Bell Bakery in the October 17, 1908 issue of the paper, and perhaps an article, I can't tell. I have an article from one of the paid sites from October 29, stating that "City Bakery" had a fire, but it was minor and they intended to repair and continue. The interesting thing is that both Bell Bakery and City Bakery were located at 340 Dakota Ave. Did Bell Bakery purchase the City Bakery location after the fire? If so, why is there overlap in the time frame? Was Bell Bakery initially located somewhere else before purchasing the 340 Dakota site? I might as well get off my wallet and subscribe to newspaper site #3. Can't take it with you, right? For years, I ran across undocumented information stating that my 4th gr-grandfather, Joseph Nickerson, was a War of 1812 veteran. Everytime I saw this information, I asked the presenter for any documentation. I'll bet I asked 20 different researchers over the years where their information came from, and no one could produce any sort of document alluding to his service. He did not have a military headstone. He did not appear in any of the online databases concerning the War of 1812. No family history papers handed down mentioned his veteran status. In addition, he would have been just 14 or 15 in 1812. But it has bothered me that I was not able to get this cleared up one way or the other. Today, I received a promotional email from Fold3.com, stating that they were working on getting their War of 1812 files online, and they were ready to start on Q-Z. Without pausing to read the rest of the email, I went to the Fold3 site and started searching. Within 10 minutes, I had Joseph's War of 1812 pension file, all 14 pages of it! I have a good degree of certainty that this is him - the location of his farm in Illinois falls within the military bounty land map from the War of 1812. The dates on the paperwork are consistent with his life span. The residence listed for him later in life is consistent with what I know of him. The maiden surname of his wife wasn't an exact match, but close ("Croble" vs. "Coble") and the place of their marriage was the same (Franklin co., Ohio). The year of their marriage was also not an exact match, but close (1819 vs. 1820). There are a few discrepancies that still bother me though. The file states that Joseph Nickerson was "about 19" years old at the time of his enlistment in April of 1814. My Joseph would have been 16 at the time. Did he lie about his age? Perhaps. It's not unheard of. He is said to have married "Mary Croble" in 1820 at Franklin county, Ohio. My Joseph married Margaret Coble in 1819 at Franklin county, Ohio. I did not find any "Croble" family listed in the 1820 census in Franklin county. Joseph applied for a pension in 1871, the year before he died. His wife, Margaret, had passed away in 1854, 17 years prior. His file lists a widow, Mary. Joseph had indeed remarried, to a woman named Hannah Maria Reves, who appears in censuses as "Maria." Is it too far a stretch to believe that "Maria" became "Mary" in the pension record? According to information found at the FamilySearch.org site*, if a veteran had passed away, his widow would be entitled to draw a pension, as long as they had been married prior to 1815, when the war ceased. The rules were eventually relaxed, and after 1871, the year Joseph applied for a penion, all veterans and widows, as well as their children, could apply for pensions. So after 1871, his second wife should have been able to draw a pension on his service, if I understand the rules correctly. Joseph's second wife, Maria, left Joseph's home and moved in with her daughter in 1866, after 11 years of marriage. The reason for this is unknown, perhaps she had a health-related issue that required more care than Joseph could give her, but she did live another 22 years. Shortly thereafter, Joseph moved to the home of his daughter. One of these documents in the pension file was made with Joseph, age 73, present at the court. He signed a document stating that his wife was "Mary Croble." There could be legitimate reasons why "Coble" became "Croble" in the pension papers - perhaps Joseph did not speak clearly - but to forget the woman he married in 1819 was Margaret and not Mary seems a little harder to explain. Was Mary a nickname perhaps? But Margaret had a sister named Mary, so that seems unlikely. Dementia is also a possibility that comes to mind. Another document naming a widow were obviously filed *after* Joseph's death in 1872, and the name of the wife/widow remains consistent as "Mary Croble." This is a typewritten form, filled in with a pen, and does not have a heading nor a hint as to its purpose. I have not found a widow's pension file, which of course does not mean one doesn't exist. Perhaps Joseph's earlier error was carried over to this document. Is there some other explanation? Certainly a definitive answer as to the existance of a widow's pension might help with interpretation. The number of similarities between the Joseph in this pension file and my Joseph are great enough to make the declaration that this is indeed him, but a clear explanation for the differences as noted indicates there may be more to the story. The photo to the left is of my grandparents, Bill and Lillian Knutz, taken sometime prior to 1957, the year their farm home burned to the ground. I love the picture, but one of the things I enjoy just as much is looking around at the background of these old photos. These things tell the story of their lives, day to day. I see the radio, where Grandma first discovered soap operas. I see a starfish hanging on the wall, most likely something Lillian's father in California sent her (he liked to spend time swimming in the ocean and collecting shells). But what really caught my interest was the two wooden leaf-shaped shelves. I know my mother made these in fifth grade at age 12, as my grandmother told me, and also documented with a handwritten note taped to the back. Taking a closer look at one of the shelves tells the real story. Notice the burned wood along the upper edges of the shelf. This was from the fire that consumed their home and most everything in it, in May of 1957. Oh, the stories this little shelf could tell! As the house was burning, the family ran in and out trying to salvage as many of their possessions as possible, until the fire department arrived on the scene and took over. 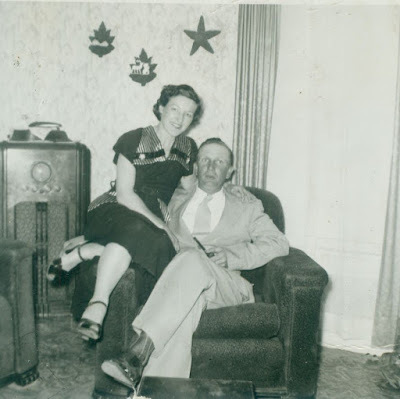 The firemen pushed grandma's piano out of the smoky house, which meant a lot to them - when they weren't busy farming, they had a dance band to bring in a few more dollars. A fireman was able to grab one of the little leaf shelves off the wall, but not the other. Much of the rest of their things, including clothes, housewares and furniture, were destroyed. The starfish was destroyed. The radio was destroyed. 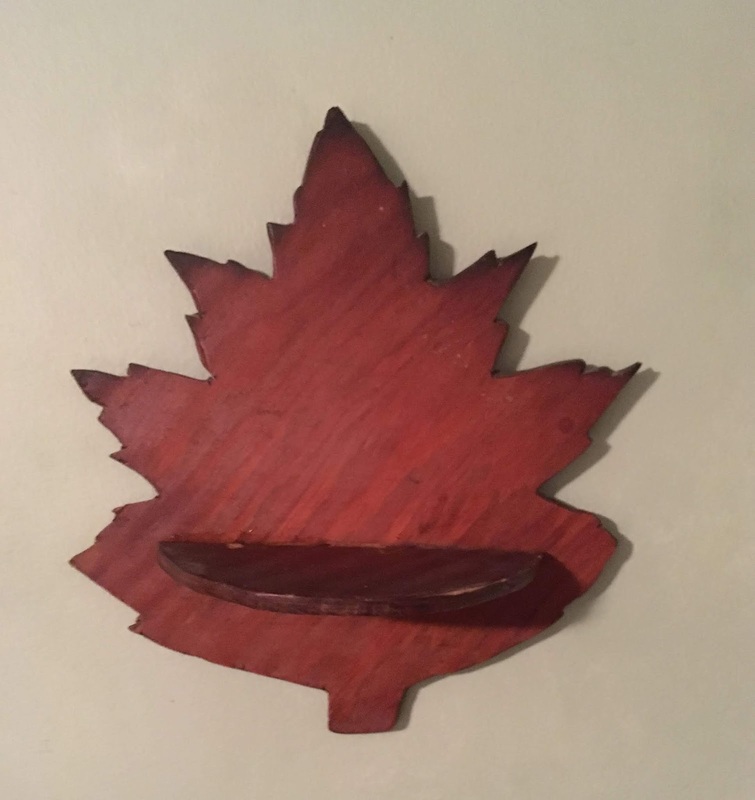 But this little leaf shelf lives on. It now hangs on our wall, with a small picture of Jesus sitting on it, just as it did in my grandparents' house in town. But the blackened edges of the wood testify to a story long, long ago and mostly forgotten.